Testocreme® is a newly patented compounded skin delivery system for hormones that contains either testosterone, DHEA, progesterone, melatonin or a combination thereof. The concentration of testosterone is increased from 2.5 to 5 or 10% in order to allow a tiny volume of cream to be applied daily for replacement therapy. This reduces the chance of skin-to-skin transference, either to a sexual partner or to a child. After initial blood serum testing for free and total testosterone, etc., the need for any bioidentical hormone can be accurately determined. Testosterone replacement therapy or TRT can be initiated and the Testocreme formula can be prescribed by any U.S. physician. 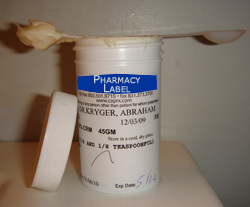 Testosterone creams and gels are prescription items and come in various formulations from small compounding US pharmacies that still make up their own “medicines”. When applied on a daily basis, the cream provides 24-hour duration of action, which naturally mimics the rise and fall of testosterone throughout the day. This rhythm called the “circadian rhythm” regulates the release of hormones. These so-called bioidentical testosterone products are safe for long term use in small doses by men who are deficient. According to the FDA, testosterone gels present no apparent health risks, and clinical trials have proven that testosterone replacement does not cause prostate cancer or swings in PSA in men of any age. AndroGel® from Solvay is a very expensive, low dose 1% testosterone product, on the market since July 2000, which provides a safe, alcohol based gel of natural testosterone in low physiologic doses. 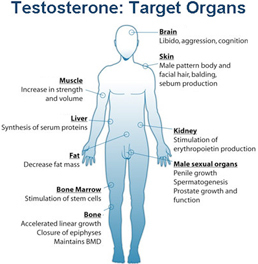 Larger amounts are required for adequate testosterone replacement by most men. Testim® fromAuxillium, released in 2004, seems to have slightly better absorption rate than AndroGel, making it more efficient, but it has a slightly musky odor. Clinical trials have also proven that testosterone patch called Androderm®, developed by Watson pharmaceuticals in 1985, is another safe form of testosterone replacement releasing 5 milligrams a day, but two patches are often needed. The higher-dose compounded testosterone creams containing 5 to 20% testosterone have been available by physician’s prescription for over a decade from any local compounding pharmacy. 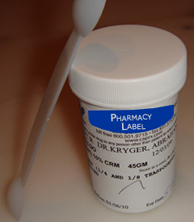 Likewise, cheaper generic alternatives to 1% AndroGel® can be compounded by many pharmacists. A low dose dihydrotestosterone, DHT gel, labeled Andactrim™, also from Solvay, has been available in Europe for almost a decade. The French have been using cream and gel delivery of female hormones for decades. Testocreme® has overcome most of the disadvantages of the earlier forms of testosterone replacement; that is, it creates more physiologic testosterone levels, skin reactions are minimal and short-term discontinuation of therapy is possible due to the longer half-life of up to 25 hours. Scrotal application is also convenient and discrete.